1.) Maybelline Rocket Volum Mascara $7.77 - I have probably tried every mascara on the market (both drugstore and high-end brands) and NOTHING beats this baby. The mascara glides on so easily and makes your eyelashes look beautiful and thick, almost like you have on false lashes. During the summer, I don't like to wear eyeshadow since it's so humid in Houston and it tends to crease. So, my mascara has to pack a punch! I truly believe this mascara is better than any high-end brand. Amber of Barefoot Blonde also raves about this mascara here. 2.) PCA Acne Gel $42- I do not exaggerate when I say this acne gel is a miracle worker. My facialist, Jaclyn of Skindustry, sells PCA products at her shop and turned me on to this gel. You only need a tiny bit when applying to your breakouts before bed, and when you wake up, your pimples will be GONE. The salicylic acid helps to dry out the blemish and surrounding oils. It's a godsend during the hot summer months! 3.) Benefit Watts Up! Highlighter $30- I only recently began adding highlighter to my makeup routine, and I love the way it lightens up and adds a bit of glow to your complexion. This Benefit Watts Up! highlighter has an easily application glider that allows you to apply it directly to your nose, under your eyes, and forehead. It also comes with a brush for blending. Love it! 4.) Chanel UV Essential Sunscreen $55- What would a summer beauty products post be without a reliable sunscreen? Chanel's UV Essential is my absolute favorite, and to me, is worth the splurge. It is specifically formulated for your face, and what I love about it is how lightweight it feels. It also filters UVA and UVB rays, free radicals, and pollution and helps to shelter your skin from hyperpigmentation. 5.) Lancome Art Liner Eyeliner $30.50- I continually rave about this product. I honestly wear it year-round and don't go a day without applying it. 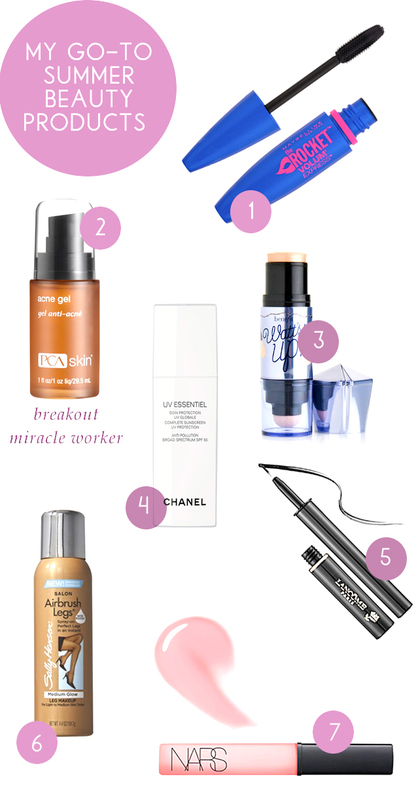 It glides on so easily and beautifully, and makes doing a winged eyeliner easy as pie. I buy it in Noir, the darkest black shade. 6.) Sally Hansen Airbrush Legs $12.79- Lindsay turned me on to this "tan in a can" product that instantly bronzes your legs when you spray it on. I love it for nights out when I wish I had had time to get a proper spray tan. I also use it on my arms and chest/back from time to time when I want to fake an all-over tan for a night out or a day at the pool. Since I am naturally pretty pale, I use the "Medium" color. 7.) NARS Lip Gloss in Turkish Delight $26- I love, love, LOVE this lip gloss. It goes on so glossy and thick and has the perfect hint of color. I wear it constantly in the summer, when I am running errands or even when going out for a night on the town. It's the perfect gloss without looking too "overdone". What are some of your favorite summer beauty products? Have any that I didn't include here? Do tell! I'm also a big fan of Watt's Up and the Nars lip gloss. Will have to try that mascara! Ooo thank you so much for the heads up on the acne gel and eyeliner! I have been looking for the right liquid type for so long and have been really hesitant to try something without a review. Also my skin is a freaking nightmare right now so I may need to look into that gel! I'm obsessed with Lancome Art Liner. I've tried to find a dupe for it, and it doesn't exist! It's the best.